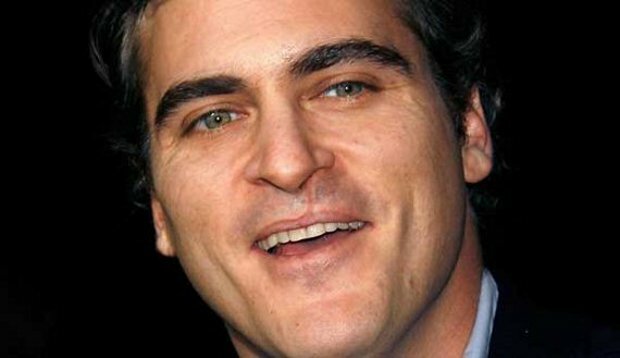 How many times did you throw away a sweater because it’s old or because you don’t like it anymore? 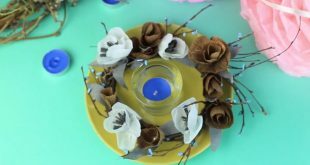 Today we’ll show you what can be done to use them again in a new creative way. 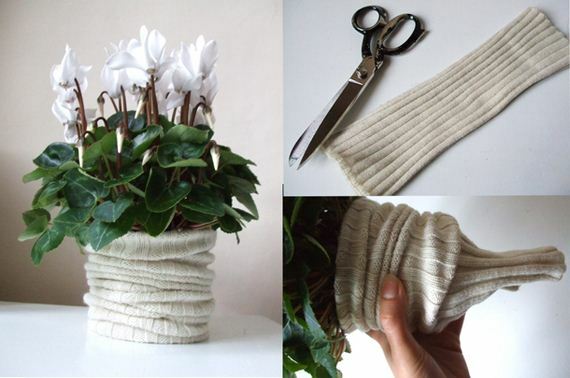 You will love the idea of repurposing old sweaters! Just have a look. The creative ideas for reusing old sweaters that are presented in the article are accompanied by simple photo instructions. 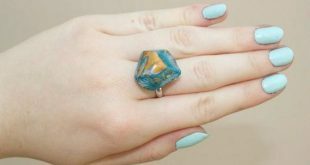 The projects are quite feasible even for enthusiastic beginners with needle and thread. 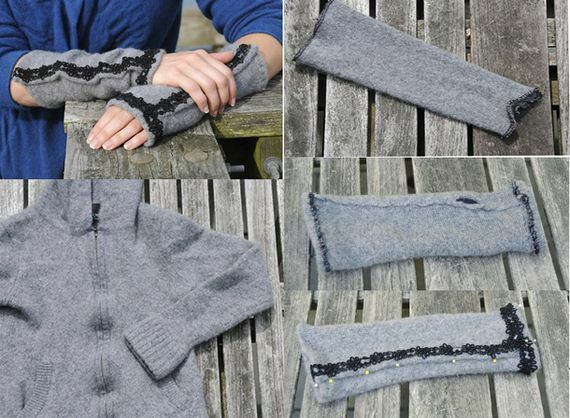 Let’s give your old sweater a second life by turning it into beautiful warm mittens! With just a few simple materials and the most basic stitches, you will have gorgeous mittens in a few minutes! 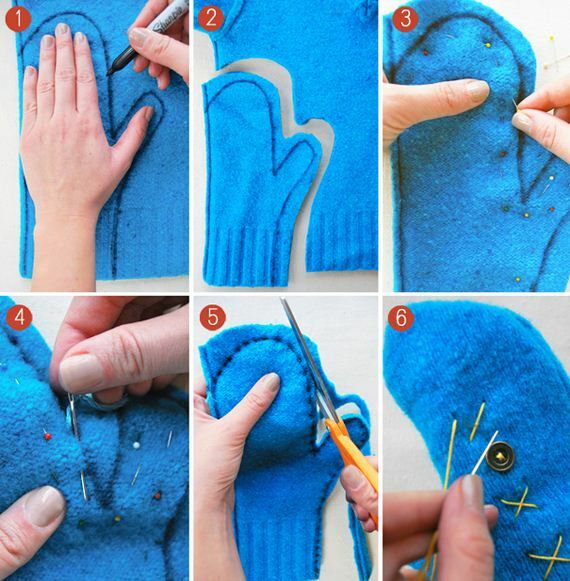 Follow these steps on the photo and read the instructions below to make mittens from old sweater. For this idea it would be better to choose a wool sweater. Hand-wash the sweater with warm water, then pat dry on a clean towel and allow to air-dry for several hours. That way the wool fibers will be huddled together so they do not fall apart when you cut it afterwards. Dry cleaning can stiffen the wool fibers and reshape sweaters significantly after drying. – Turn the sweater inside out and put it on the table. Put your hand on one of the side edges and outline the mitten shape around it. Add approximately 1 cm on the outside of the perimeter and cut along the contour of your mitten. – Pin several safety pins on the edges to keep the two layers from shifting while you sew. – Thread the needle and do simple stitches along your contour. Make sure that the lower part of the mitten is wide enough so that your hand could easily fit. Remove the excess fabric. Be careful not to cut too close to the stitching. 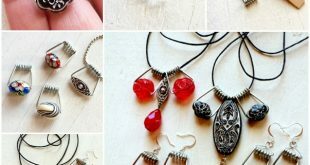 – Now the fun part! Remove the pins and turn over to see the finished mitten. 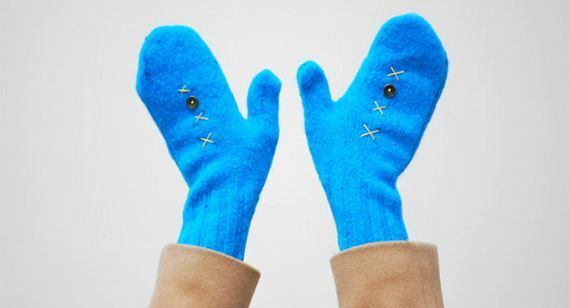 – Use buttons, colorful threads and other decorations to make the mitten more interesting. – Repeat all the steps for the right hand mitten. 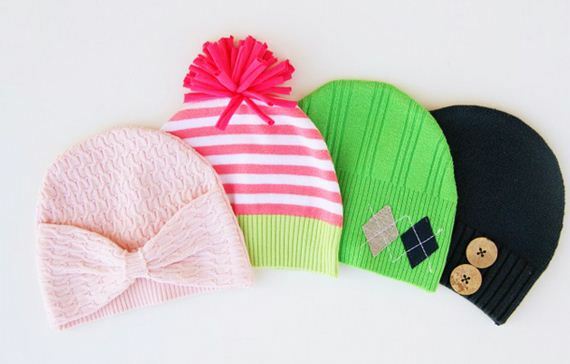 From one or more old sweaters – for example one of those that children will no longer wear because they grew out of them, you can make warm hats for the winter. You can also use the extra fabric to decorate them. 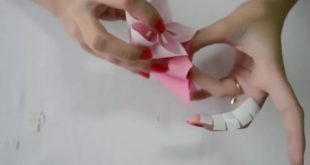 This project is similar to the mittens. From old sweaters you can get a very comfortable bag. All we need is an old sweater, scissors, needle and thread in the right color. Here are step by step instructions of how to turn an old sweater in a new bag in no time and without any expenses . 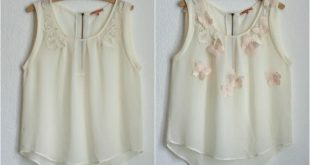 – Cut the sleeves and neckline of the sweater. – Place the fabric in position so that the side seams meet in the front. 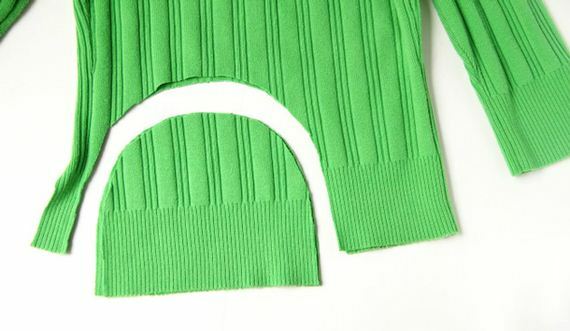 – Pin pins along the bottom of the sweater and sew a straight line to join the two sides. – Turn inside out. Done! 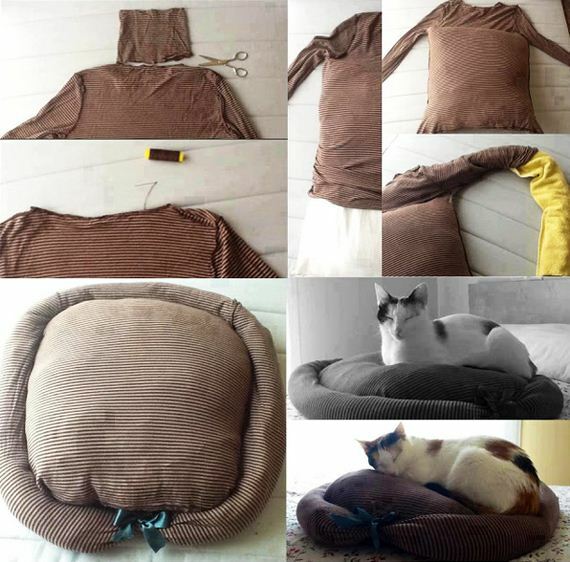 Another idea for repurposing old sweaters – a place for your pet. It’s implementation is very simple. 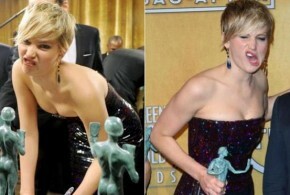 Follow the step by step instructions on the photos. With the help of an old sweater, you can keep heating pad warm for much longer, all you need to do is to cut and sew a cover. Simple but interesting touch to your home decor. To get stylish leggings just cut the sleeves of the sweater. Do not forget to wrap and secure the needle and thread the cuts. One of your old sweater can be ideal to create new decorative throw-pillows. It takes a minimum of cutting and sewing, but these pillows will please the eye and create a warm and inviting atmosphere in the house. You can decorate them as you wish with buttons, wool flowers, or other decorations. If you have a lot of unused sweaters in your closet, you can combine them to make a blanket or a quilt. You will need to cut each sweater in to pieces in order to obtain a “patchwork” style. Imagine how useful it would be to have a blanket at hand on the couch in the cold winter evenings. – Cut the sleeves of the sweater. – Define the length of your finger gloves. Add about 2 cm to the length and cut. – Secure the cut on a sewing machine with a zigzag stitch or overlock. – Wrap the ends of the sleeve by 2 cm and sew with a needle and thread. – Put the glove on your hand, and define the location for the hole for the thumb. Cut where you want it to be. Gently unravel the threads of the seam until the hole gets a comfortable size for the thumb. Then fix the hole with a needle and thread. – Since the sleeves a little wider than the gloves should be, you need to reduce a bit their diameter. 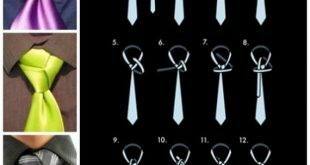 To do this, put the gloves on your hands, hold the excess fabric along the length of the sleeve, attach several pins. – Remove the gloves. Secure and stitch with a needle and thread, using the back stitch. Now your favorite sweater can stay with you for a few more years!